Home / Articles / Is an Electric Toothbrush for Braces Okay? When you get braces installed the dentist may send you home with a brand new toothbrush that has a little spool on the end to get all the bits under your wires clean. This is a nice gesture, but is it really necessary if you already have a fancy electric toothbrush at home when wearing braces? If you are nervous about using the power tool equivalent of a toothbrush on your braces, do not worry. While a manual toothbrush and special tools can help to keep your braced teeth clean, an electric toothbrush is perfectly fine to use if that is your preference. Electric toothbrushes are preferred by many due to their ability to work through brushing your teeth and gums faster and more thoroughly than manual brushing. Studies have shown that no matter which method you use, as long as you brush for two minutes you are removing most of the plaque on your teeth and preventing buildup. Still, depending on your personal technique it may be much easier to get that squeaky clean feeling every time with an electric brush. For some people, manual brushes just do not cut it. There is no reason to give up your electric toothbrush when you get braces and, in fact, it can be more beneficial than using a manual one. One of the major concerns for electric toothbrush users is popping a bracket loose with the force from the brush. Luckily, this is an unfounded fear and pretty difficult to do. Each bracket is cemented to each tooth with high strength dental cement and then immediately “cured” in order to bring the bond to full strength while you are sitting there in the chair. By the time you leave the dentist’s office, those puppies are as set as they are ever going to be. You should be able to use your electric toothbrush that very night before going to bed and not have any problems with things coming loose. The wired portion of braces is attached to the brackets with small rubber loops. These are pretty tough and mostly protected by the bracket structure so it is not very likely you will pop one off with regular tooth brushing. If you do then your dentist can put a new one on in less than a minute. If you notice that you are having this problem more than once while brushing then try using less pressure and make sure you are using a brush head with the softest bristles available. If you are the kind of person whose toothbrush head ends up looking flattened or splayed out after a few months then you should be doing this anyway. Pressing too hard when brushing and using a brush with bristles that are too stiff can scratch and damage your enamel. This can lead to sensitivity as the dentin underneath becomes exposed. When you have braces attached to your teeth, the tooth surface underneath the cement is not exposed to anything you eat or drink. The rest of your tooth is obviously unprotected though. It is, therefore, vital to have very good oral hygiene and avoid staining foods or beverages for the duration of the process. These are good things to do anyway for the life of your teeth but if the exposed portion of your teeth becomes stained or darkens then you will have lighter squares where the braces were after they have been removed and the cement has been polished off. For this reason, it may even be preferable to switch over to an electric toothbrush when you get braces since most people find it easier to maintain good oral hygiene when using these instead of manual brushes. There are several types of electric toothbrushes available. The main differences tend to be in the size of the head and the motion in which it moves. If you have found a brush that works well for you then try to continue to use it after you get braces. 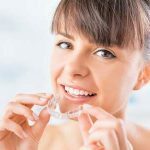 Some find that the ones with smaller round brush heads can navigate around braces much better than the ones whose heads are similar to a manual toothbrush. If you are having trouble getting everything clean with the brush you already have then tried a different type of toothbrush head. For each shape of head, there are also many configurations of bristles to address different oral concerns. A brush head that has some longer portions like this Oral B flossing brush might do a better job at getting into all the nooks and crannies than a standard flat brush. Whichever route you take, just be sure that your brush has been approved or endorsed by the ADA. 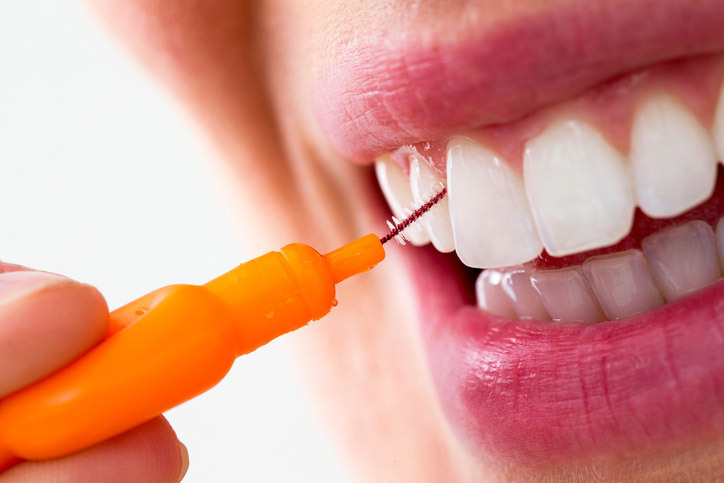 On the subject of flossing, it is vital that you continue to floss after having braces put on. 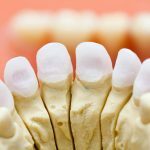 Teeth do a good job on their own of creating spaces and traps for food and plaque but adding braces to the mix makes this problem much more complex. If you have trouble using traditional flossing methods around your braces then you might want to consider switching over to a water flossing method, such as a Waterpik. This will shoot water between your teeth to remove any food and debris that is caught. Some braces wearers even like this option more because it can also help dislodge food that may become caught in the braces as well. If you do not want to give up your electric toothbrush or even want to start using one to make sure you are taking the best possible care of your teeth and braces, feel free to do so. There are plenty of options to choose from and your dentist should be knowledgeable enough to give you recommendations as to the best one for your situation and budget. Be sure to follow all of your dentist’s instructions for taking care of your teeth and braces. The last thing you want after months of working on a straight smile is to have odd discoloration when they are removed or even cavities.